Science progresses by leaps and bounds, but it's not easy to chart its progress. Metrics can only do so much to quantify scientific developments. Yet there are periods when it's clear that the rate of progress in certain scientific fields is phenomenal. For instance, nobody can deny that physics underwent an earth-shattering transformation in the first thirty odd years of the twentieth century, perhaps the greatest it ever experienced. With relativity and quantum mechanics completely changing our view of nature, a physicist who had been flash-frozen in 1900 and resurrected in 1930 would have found the state of his science almost surreal. Similarly, biology completely changed itself and our view of life between 1950 and 2000. What about chemistry, and especially chemistry in the last few decades? While any quantification of chemical progress is ultimately subjective, it would be an amusing and instructive exercise to ask what some of the pioneers of chemical science would have felt about the state of their discipline if they had been flash-frozen just before they died and brought back to life in the year 2011. Viewing today's world through the eyes of these men and women could be a good way to discover exactly how much their field has changed. 1. What would Woodward say? "It's quite something to be transported to the year 2011 and I am glad that the technology of time travel has developed rapidly enough to make this possible. When I died in 1979 I had already pioneered the synthesis of complex molecules. I am somewhat disappointed that the state of that science, while consistently strong, has not seen any fundamental transformations in the nature of the molecules being synthesized. Using more primitive and time-intensive methods, I am confident that I could have synthesized in 1980 almost any molecule which my colleagues are synthesizing in 2011. I am however very impressed by two major advances which I did not foresee during my lifetime. The first is the staggering growth of organometallic chemistry. With my role in the discovery of ferrocene I consider myself a founder of the field, but I could not possibly have seen such tremendously useful applications of palladium catalyzed reactions, asymmetric epoxidations and olefin metathesis. I offer my most enthusiastic congratulations to the pioneers of these novel methods. As an aside, I am also quite taken by how efficient and routine asymmetric synthesis has become. My synthesis of reserpine is considered one of the first examples of stereoselective syntheses, but the total synthesis of the same molecule by my friend Gilbert Stork in 2006 seems so much more sophisticated and rich with applications of conformational analysis and stereocontrol. If I am impressed with the development of organometallic chemistry, I am floored by the rise of chemical biology and chemical genetics. By the time I died there were already many very competent biochemists around, but there was no concerted application of chemical synthesis to an understanding of biology. This was partly because we lacked an understanding of biological systems that was made possible by the phenomenal developments in molecular biology that followed my death. It's quite amazing to witness the routine study and manipulation of complex biological pathways using intricately designed molecules. I can only see a bright future for these ideas in chemistry and medicine, and am glad that my student Stuart Schreiber has been one of the pioneers in the field. Well, that was nice. But I need to go back now and spend my last few days working on ideas for organic superconductors." 2. What would Pauling say? "How wonderful to be here! Having been fortunate enough to have lived for the first 93 years of one of the most important centuries that we humans have lived in, I still could not make it to 2011 to witness the achievements of chemistry in the twenty years since my death. Many people consider me the greatest chemist of the twentieth century and I did indeed cross disciplinary boundaries with impunity, having worked significantly in theoretical chemistry, organic chemistry, biochemistry and medicine. So there is a lot of ground to cover. Let me start by looking at progress in the field which I am most known for. By the time I died, computers had already become prominent in molecular orbital calculations, although I could not possibly have foreseen how fast and small they would become. I am glad that computational chemistry has turned into an independent field of chemistry. It still seems almost as challenging as it was then to apply theoretical methods to complicated systems and especially biological systems, but I feel gratified by the development of 'mixed' methods such as quantum mechanics-molecular mechanics (QM/MM) which simplify calculations without sacrificing accuracy. I must especially congratulate my last student, Martin Karplus, for pioneering the applications of theoretical methods to biological systems. I see a continuing bright future in this area, along with further developments in computer science that would allow us to tackle complex systems. I am especially gratified that these methods have brought computation to the masses, so that even non-specialists can now do detailed calculations and get useful answers. As someone who is considered to be one of the founders of molecular biology, I was fortunate to have lived long enough to witness the rise of recombinant DNA technology. But like Prof. Woodward I too am very impressed with the rapid growth of chemical genetics in the last twenty years. I am very happy that chemists have taken my ideas about molecular recognition to heart and that they continue to use these ideas to develop new drugs and antibodies against diseases. I am also awed by the sheer amount of information coming out of genetic sequencing, and as someone who described the first genetic disease at a molecular level (sickle cell anemia), I am proud that scientists are now routinely exploring the molecular basis of genetic disease as an aid to develop personalized drugs. As a chemist, I would however caution against putting too much faith in the data itself and actually looking at the molecular events. Overall then, I am very pleased to witness this growth of science. However I must also reinforce my commitment to peace (after all I did win a Nobel Peace Prize) and emphasize that this growth should serve both the most and the least fortunate among us. We do science not just for ourselves but for others"
2. 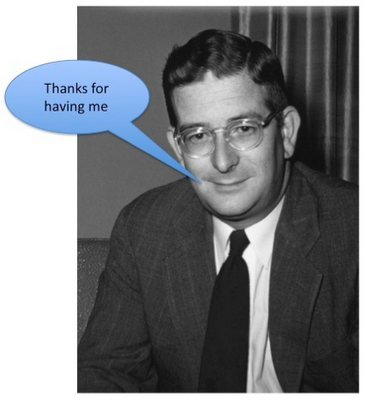 What would Langmuir say? "It's somewhat amusing for me to realize that I am almost as famous for my description of "pathological science" and pseudoscience as I am for my eponymous isotherm. But let's stick to the actual science. I died in 1957 and I was awarded a Nobel Prize for surface chemistry in 1932. I cannot even begin to express my amazement at the phenomenal advances in surface and related sciences since my death which have partially been honored with the Nobel prize in 2007. When I died I could not have imagined in my wildest dreams that someday we could have instruments that could literally map a surface atom by atom, sensitively rolling over the contours of a molecular landscape the way a finger might roll over a bed of marbles. The invention of the scanning tunneling and atomic force microscopes have given us a tactile view of the atomic world that is beyond anything we could have dreamt of in 1957. I am fascinated by the emergence of the entirely new discipline of nanoscience which was only being imagined in 1957 (Author's note: For instance Richard Feynman gave his famous talk about nanotechnology in 1959). I can only assume that this amazing molecular manipulation of matter will continue and will pay dividends in both pure and applied science. Speaking of pure science, before I leave I feel a strong urge to step on my soapbox and lament its decline. Anyone who thinks that high-quality basic science cannot be sustained in industry should only cite my example. I spent my entire career at GE and yet become the first industrial scientist to win a Nobel Prize in chemistry. When I scan the history books I find many other industrial labs like IBM and especially Bell Labs that were hotbeds of prizewinning scientific talent; for crying out loud, the scanning tunneling microscope that we mentioned was developed at IBM and its developers won the Nobel Prize. How times have changed! Former industrial labs like Bell Labs are now either non-existent or are mere shadows of their former selves. As my own example demonstrates, basic science in industry was one of the things that made this country great, and its decimation can only lead to a great decline in America's scientific health. Let me say this out loud; a nation which lionizes short-term profits at the cost of long-term investment in curiosity-driven basic science is on its way to scientific mediocrity. I dearly hope that the next generation reverses this damning trend. On these dual notes- positive regarding the state of nanoscience but negative regarding the state of scientific research- I must now take your leave." 4. What would Werner say? "I died in 1919, so the world that is being presented to me in 2011 is in every way beyond recognition. But let me stick to my field. I am often called the "father of coordination chemistry" but I would be lying if did not say that I barely recognize my children. At the same time I am as proud as any parent can be that my field has progressed beyond its original borders and become a vast and productive enterprise. I merely demonstrated the existence of several inorganic complexes and postulated the concepts of primary and secondary valences and isomerism. But I had little inkling about the precise nature of bonding in these complexes. Now I see that it was about the time that I died that Irving Langmuir and Gilbert Lewis were developing ideas about the shared chemical bond. I am of course very impressed by the contribution of Linus Pauling who pioneered ideas about electroneutrality and the partial covalent character of ionic bonds. It is truly astonishing how much our knowledge of chemical bonds has developed. However it is to scientists like Hans Bethe, John van Vleck, Carl Ballhausen and Leslie Orgel that I must doff my hat. These scientists delineated the precise nature of bonding in coordination complexes. How wonderful it is to read about the relatively simple rules that predict the coordination number of a ligand, the propensity of certain ligands to bond to certain metals, and whether a complex is high spin or low spin. I can see that my tentative ideas have been placed on a sound theoretical footing. Ultimately however, I am astonished by the application of coordination chemistry in industry and biology. It cannot be anything but gratifying to know that EDTA can be used to mitigate lead poisoning and that other ligands can be used to mop up chemical spills. And it seems that my studies have ultimately been a part of the entire field of bioinorganic chemistry where ideas about coordination complexes are used to study the interaction of metal ions with proteins. I feel humbled that I played a role in the development of such an important and major area of chemistry, and I feel confident that this field will thrive. I go back to my own times with the reassurance that my children will continue to instruct, grow and proliferate." And so we can all hope and strive so that the intellectual children of these four and countless other chemists will instruct, grow and proliferate. What would Woodward say if he were alive? Why conduct reactions at low temperature?